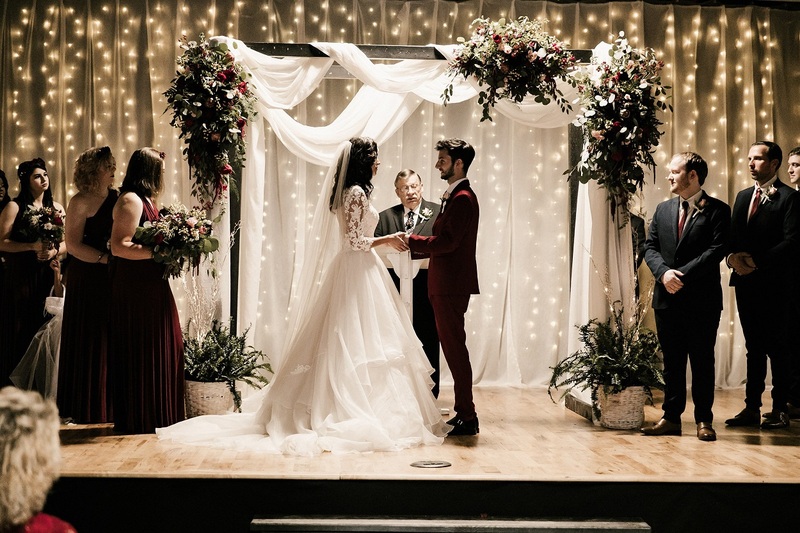 The Betty H. Long Stage in the Roxboro Community School multipurpose room served as the perfect spot for a November wedding between two RCS graduates. Amaris Kirby Elder and Wesley Elder have fond memories of their high school days. They can now add wedding bells to the special moments they shared on the campus of Roxboro Community School (RCS). 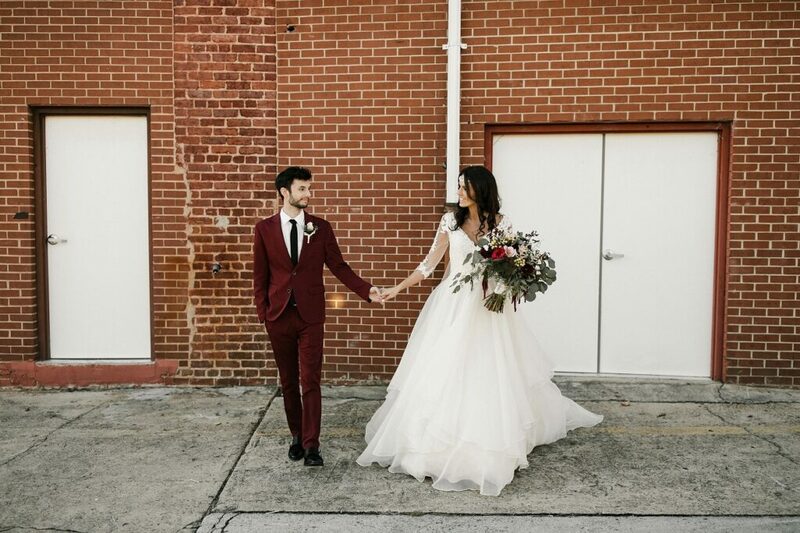 On Nov. 10, 2018, Amaris and Wes got married at the school, after about nine years of being together. The school is a special place for both of them. “It was where they fell in love,” stated Rosie Kirby, Amaris’s mom. The idea of holding the wedding on the RCS campus was first pitched by Wesley’s mother, Cassandra Elder. Wesley then suggested the idea to Amaris, and soon, “they both latched on to the idea pretty quickly, since the school meant so much to both of them,” said Elder. In 2015, RCS began a five-year fundraising campaign that led to around 30,000 square feet of additional usable space that includes a multipurpose room, gymnasium, concession stand, athletic lounge, weight room, boys' and girls' locker rooms, warming kitchen, and four additional classrooms. These new additions to the school also had some effect in the decision about where to hold the Kirby-Elder wedding. “Once they saw the new multipurpose room, and that it still had its original brick and rustic feeling, they were on board,” Rosie Kirby said. Weddings in nontraditional settings are nothing new in the Kirby family. Rosie and her husband, Tracy were married at Hyco Lake, and left the ceremony on a boat. Amaris and Wes first met in kindergarten at Roxboro Christian Academy. After that, Wesley attended Bethel Hill Charter School and later went to Northern Middle School. Amaris attended Roxboro Christian Academy until she transferred to RCS in her junior year. The couple began dating their senior year in high school, at RCS. “My favorite memory from high school is when Wesley asked me to go to prom our senior year,” said Amaris. “I remember coming back from Tricia’s (Espresso) with coffee, and as soon as I walked in the front door, there were a ton of people looking at me over the railing upstairs in the atrium. At first I thought they were doing a science project or something but then when I looked over at the library doors, there was a huge banner that said ‘Amaris Kirby, will you go to prom with me?’ with Wes standing right under it. So I ran up the steps and jumped into his arms saying, ‘Yes!’ Everyone watched, clapped, and cheered. It was like something from a Disney Channel movie,” said Amaris. After high school, Amaris went to Piedmont Community College, then transferred to UNC Chapel Hill, and Wesley spent a year and a half in Argentina studying Spanish and later the Bible. Together, the couple worked on a movie titled The Matchbreaker, as well as other acting projects. The Matchbreaker is about a young man hired by a disapproving mother to break up her daughter's relationship. From there, he becomes a professional “matchbreaker” and ends up falling for one of his clients. He learns that he has to balance his job with his love life, however. The movie was previously on Netflix and is now on Amazon Prime. For their wedding, one of Amaris Elder’s friends from high school, Jessica Murray, was one of the bridesmaids, and Wesley’s best man was David Schreffler, who graduated in the same class as Wes and Amaris. The wedding seating was set in two rows in the RCS multipurpose room, with an aisle down the center of the large room. For the reception, tables were placed in the school’s atrium, with a small area reserved for dancing. From upstairs, guests could look down into the lobby at what was taking place below. Following their wedding, Amaris and Wesley Elder spent two and one-half weeks traveling around Italy, Switzerland, and France. They currently live in Kansas City, Missouri. The photographer Blake Hogge may be reached at (801)602-555. Roxboro Community School, a public charter school for grades six through 12, is housed in the former Roxboro Cotton Mills/Tultex building, constructed in 1899. It is on the National Register of Historic Buildings. Amaris Kirby and Wesley Elder tied the knot at Roxboro Community School, their alma mater.